Thanks for the great feedback on my last post -- you guys are so wonderful! We really love reading all of your comments. Hope you all are having a wonderful weekend -- and for our U.S. readers, hope you're enjoying the long weekend. Because my birthday is tomorrow, I thought it would be fun to go back and talk about one of my more memorable birthdays -- my 20th. 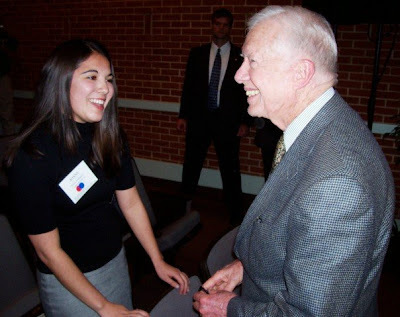 How I spent it: Oh you know, meeting former U.S. President Jimmy Carter. 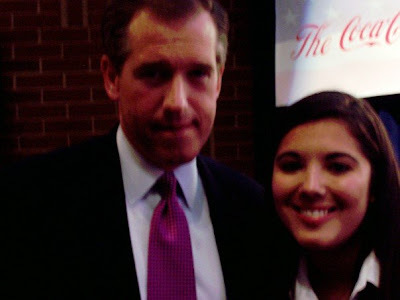 And NBC Nightly News anchor Brian Williams. And Secretary of State Madeleine Albright. 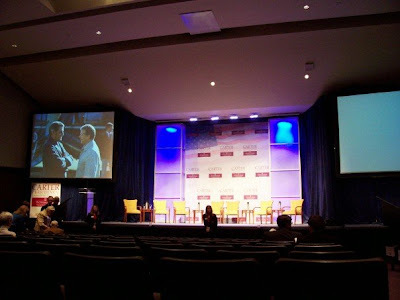 The back story: My college was hosting a symposium to celebrate the 30th anniversary of Carter's inauguration and to examine how American politics has changed in that amount of time. They invited pretty much everybody from that administration, including former White House intern Williams (who was the host of the event). The first day of the symposium fell on my birthday, and being the political nerd that I am, I begged my parents to buy me a ticket for the entire weekend's events as my gift. They agreed and I had it booked in early November, like the overzealous, over-punctual political nerd I apparently was (and still am). By January, you can bet I was excited. My dorm building was right next door to the conference hall for the symposium, so on the day of the event there were Secret Service agents about 20 feet away from my building. Not an everyday sight. The conference hall before the morning talks. So the actual content of the symposium covered a wide range of topics: energy, terrorism, diplomatic relations, media coverage, you name it. One of my friends even gave a researched presentation (in front of President Carter) about some aspects of Carter's presidency and their significance. What a life experience. There was also great food there. 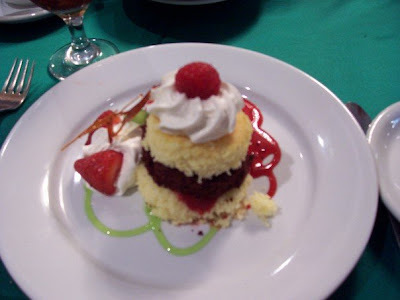 Check out my dessert from lunch. At this point in the story I met President Carter. During one of the breaks I mulled over whether I wanted to: a) dart over there to meet him, b) walk with purpose but at a slower pace in case the Secret Service thought I was going to pull a fast move or c) even bother at all because it's a former president and that's nerve-wracking. I chose a combo of A&B. It was something like a half-hearted sprint, if you could imagine. I was third in line. When it was my turn, I told him thanks for coming, this was a cool experience and congrats on thirty years. And then I told him that it was my birthday, and he was like, "Oh, it's your birthday? How about a kiss for the birthday girl!" and proceeded to grab my cheek and kiss it. It was very surreal but actually nice. It just happened and I was left feeling very giggly and unnerved by my 15 seconds of quasi-fame (a few bystanders and advisers cheered and the local paper's photographer snapped a photo during the moment but I haven't found it online). Anyways, the rest of the symposium went downhill after that ---how do you top being kissed by a president? I kid, it was still a great time. It was just briefly because I was that one person in line to meet him right before he had to moderate another talk, so this photo was taken very excitedly by an NBC producer. Still, super awesome to meet a journalist whose career and daily work I admire. - Meeting Madeleine Albright. That photo came out too blurry, but she was really nice to me. - Brian Williams announcing to the conference that then-Senator Hillary Clinton had just announced her bid to run in the 2008 presidential election. Regardless of your personal politics, it is really cool to hear history-making news from the man who hears it before anyone else. - Almost tripping over Walter Mondale during one of the breaks and almost bumping into Rosalyn Carter in the bathroom. Okay, that's not really a highlight, but I just wanted to point out that even though there was Secret Service, many of these leaders were very down to earth and accessible to the symposium-goers. And it was a great day. What was your most memorable birthday experience? Well, I'm about to head out and enjoy some time out with Jeremiah's family. Hope you all have a lovely night! No memorable birthdays stick out my mind, but it's because I'm always too busy to really enjoy my birthday. what a fun story, congrats on getting a big wet one from President Carter!! I also got the opportunity to meet Madeleine Albright at the Library of Congress and had our picture taken together. Even though she's a regular person just like you and I, still I got all excited and smitten! I remember this! What a cool picture of you and Jimmy! I hope you have a fantastic birthday, and we need to meet up for drinks sometime. My schedule is ridiculous, somehow all my evenings are filling up. Let's catch up on gchat sometime soon! What an incredible experience! Happy Birthday! Sounds like an unforgettable birthday! How fabulous to meet (and get a kiss from) President Carter.